File Transfer Protocol (FTP) servers are useful especially if you are hosting files that will be accessed by remote users on the Internet. This article will give you instructions on how to set up an FTP server behind a Linksys router. If you are using a Linksys Smart Wi-Fi Router, click here instead. This article will discuss the guidelines in setting up an FTP server behind a Linksys router. You might need to refer to your ISP and third party providers to accomplish the task. 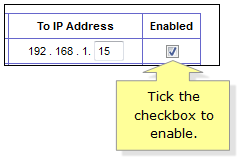 On your server’s TCP/IP settings, set up a local network Static IP. Refer to your server documentation or contact the manufacturer for instructions. NOTE: Ensure that the Static IP Address you set is within the same LAN segment as your router. Most Linksys routers are in 192.168.1.x range. Most Linksys routers have DHCP Reservation feature. This will allow you to assign a specific IP Address on a certain device for easy access. To know more about this feature, click here. Contact your ISP for details on how to get a Static IP account. Having a DNS account can be a good substitute to having a Static IP account. Some DNS accounts have a free one (1) year trial. Refer to DNS providers for more information. Once you have set up the IP Address of the server computer and the WAN IP of your network, you should now forward the FTP port to the server’s local IP Address. This will allow all FTP transactions to be sent to the server’s IP Address. NOTE: Images may vary depending on the model and firmware version of your Linksys router. Access the router’s web-based setup page. To learn how, click here. On the Setup page, click Applications & Gaming. Under Single Port Forwarding sub-tab, select FTP for Application. NOTE: If the Single Port Forwarding sub-tab is not available in the web-based setup page you have, you may use the Port Forwarding sub-tab instead. For instructions, click here. NOTE: The External Port, Internal Port and Protocol fields will be automatically filled in. 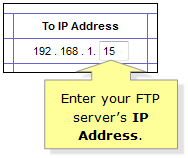 Enter the IP Address of your FTP server under To IP Address. NOTE: In this example, 192.168.1.15 is used. Tick the Enabled check box. You should now be able to access your FTP server using either the Static WAN IP or the DNS account.